I am on a mission to try to find and convert to more natural and gentle products when it comes to mine and my families skin. I think I just realised a lot of the jargon on the back of products is usually to disguise the hidden ingredients we wouldn’t choose to put on our skin. I recently discovered the wonderful brand MooGoo Skincare who use only the safest, most natural, food grade ingredients. 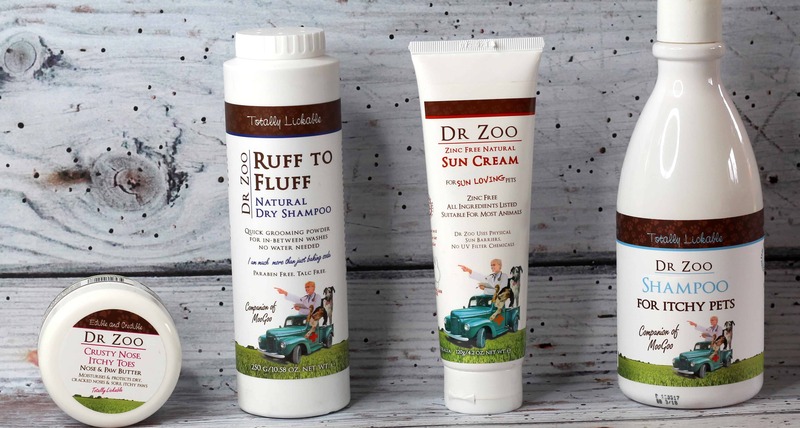 All of their products are completely safe to use on babies, children and adults – which is a great sign!! MooGoo Skincare are an Australian company that do a whole range of products that are natural but effective. 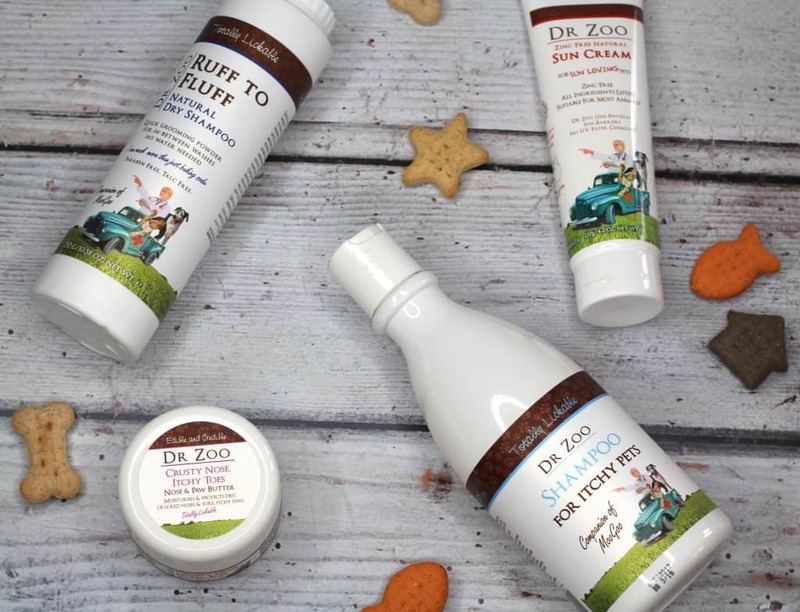 They also do a natural range of chemical free products for pets called Dr Zoo! 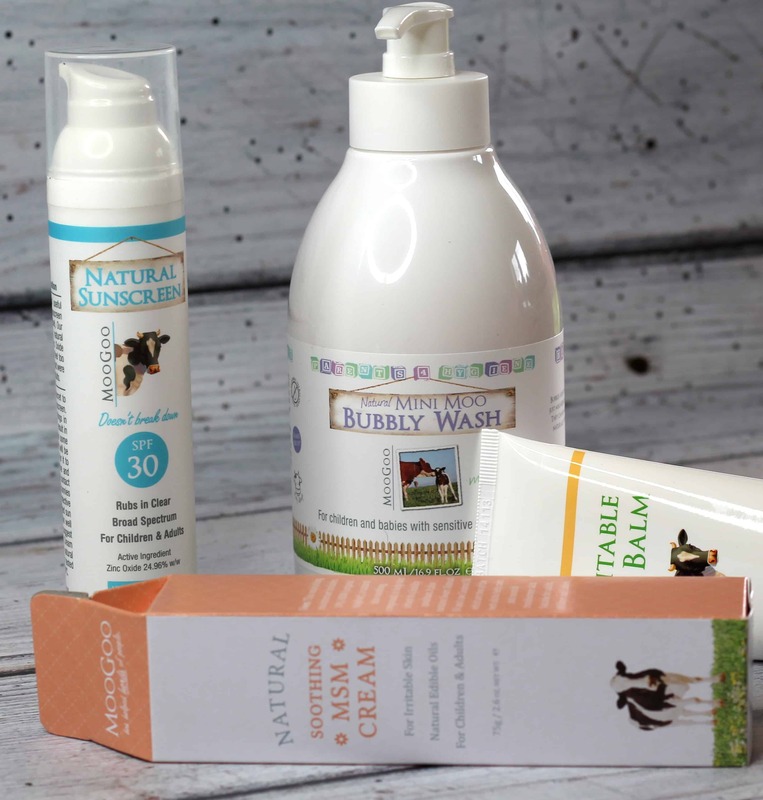 Each of their products is safe to use during pregnancy and breastfeeding which is a really positive sign. Any products that aren’t safe during pregnancy set alarm bells ringing. 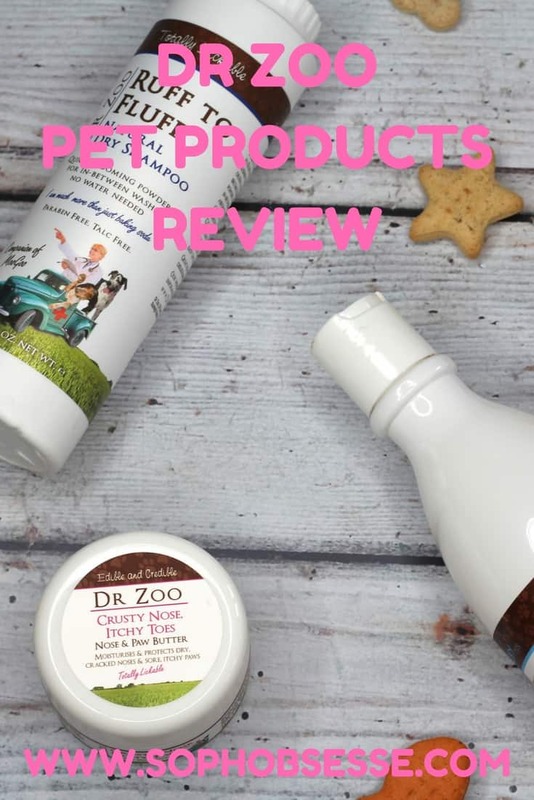 I’ve been trying a few of the great products from both the MooGoo Skincare and Dr Zoo range. As you will know if you have been around my blog for a while, I suffer with Psoriasis and because of this it’s important that I use products that are gentle and non irritating on the skin. I also have a five-year old who has sensitive skin and therefore doesn’t want to be using harsh cleansers. 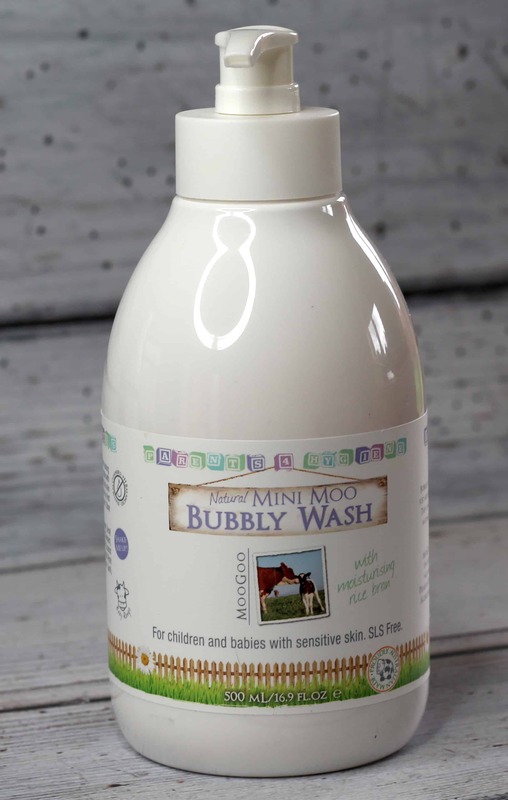 The Natural Mini Moo Bubbly Wash is perfect for both of us because it contains no nasty harsh chemicals but is still an effective wash. There is a lovely, subtle scent to the wash without it being artificially perfumed which I love. 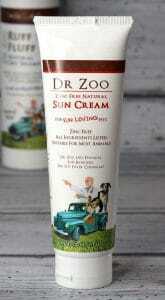 It also contains moisturising rice bran and left my skin feeling clean and really soft. As it comes in a pump dispensing bottle it meant that Henry was able to use the wash independently without wasting using too much! Although we have both been using it everyday we still have loads left as a little goes a long way. 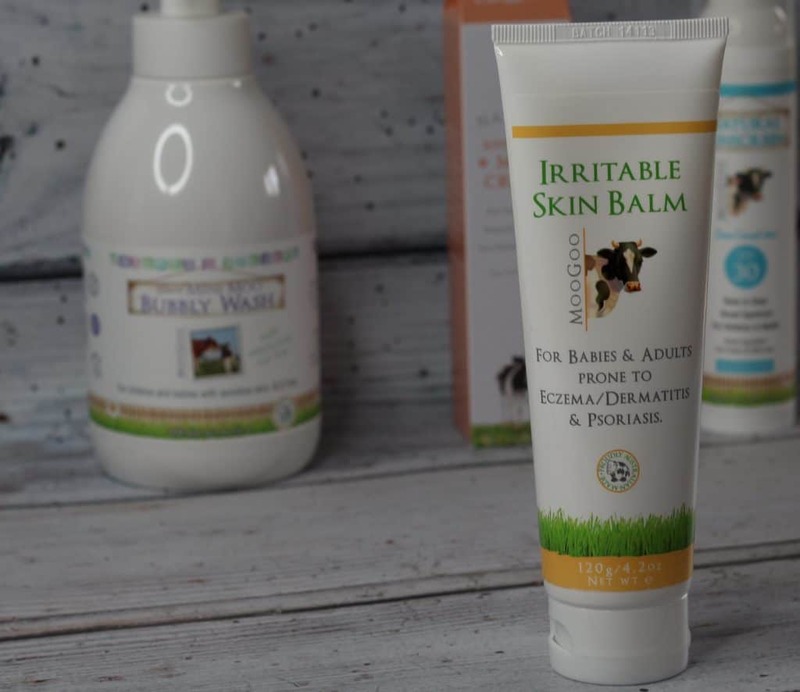 The irritable skin balm is perfect for psoriasis sufferers like myself. The cream contains natural anti-inflammatory ingredients and soothing natural oils which help put a stop to the nasty itching caused by psoriasis. As it doesn’t contain harsh medications it can be applied as necessary – no more need to suffer! This product is also safe to use on babies, so if they are suffering this could really help! I thought the balm was really effective and soothing. I liked that it was effective without the need for harsh medications! 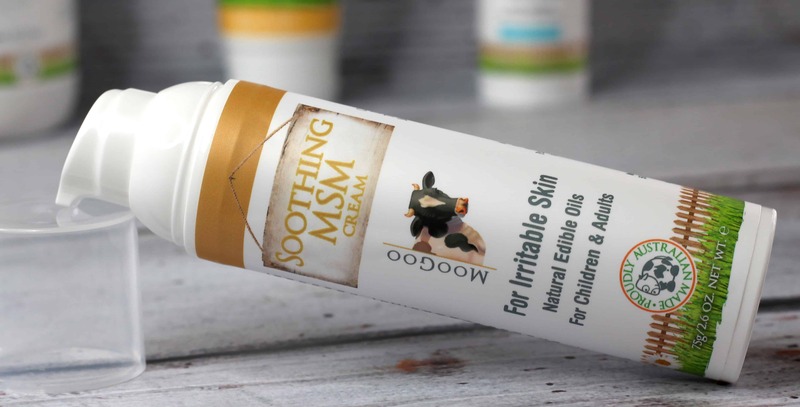 After I have applied the irritable skin balm to any psoriasis areas I follow-up with the Soothing MSM Cream which is a soothing all over moisturiser. My skin feels soft, without feeling greasy, which is a feeling I literally HATE when it comes to skin care products!! The cream is packed full of natural skin healing ingredients which, compared to the prescription creams I have been given in the past is a relief. The cream was very soothing and using it regular I am beginning to see a difference in my skin! I hate applying sunscreen. I think it’s tedious and by the time I’ve lathered up the whole family it’s time to start again. I know the importance of a good sunscreen though and despite my pure hatred for it I persevere. Sometimes sunscreen is greasy which just makes my skin crawl but the Natural Sunscreen from MooGoo Skincare is as far from greasy as you can get. The cream is more of a thick paste which you apply by smearing across your skin. You let the cream sit for around 30 secs to a minute whilst your body heats it up slightly and then rub in until it goes clear. It’s easy to rub in, no greasy film and the best part is that it doesn;t breakdown like other sunscreens so you don’t need to keep reapplying! We have had some unusually HOT and sunny weather for the last few weeks and I have had ample opportunity to test the cream out. I have to admit I absolutely love it and I think out of all the MooGoo products it was my favourite! One slight issue is that because the cream comes in a pump bottle it can jam the end up because the cream is so thick. I was literally half way through applying when I had to down tools and figure out how to get the cream out. If you turn the bottle upside down and really bang it then it works again. It’s simply a floored design because the cream is too thick for the type of bottle. I spoke to MooGoo about this who confirmed they are already in the process of changing the bottle so this doesn’t happen. Once that is done this will be my absolute go to sunscreen!! 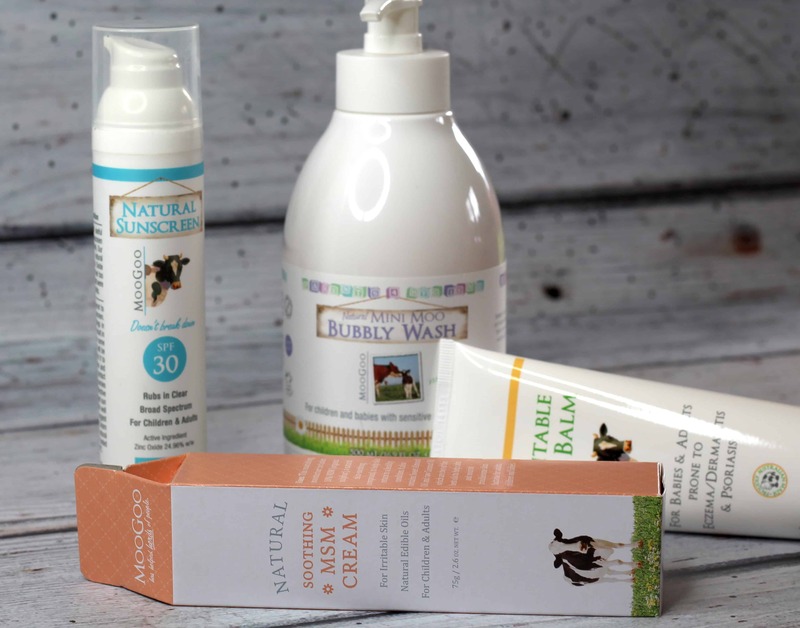 MooGoo Skincare also do a range of products for dogs which is also completely natural. I figure if I don’t want to be using harsh chemicals on my skin I should at least extend that to my dog Stitch right?? Stitch is a French Bulldog puppy who is renowned for having itchy skin. It’s a typical trait of bulldogs unfortunately so I was thrilled to learn that the Natural Calming Shampoo is designed to prevent irritation occurring during washing but also calm and soothe any current irritation that may already be there. When I used this on Stitch he was very itchy and almost wearing out a patch of fur from scratching. After washing there was a noticeable difference in his itching and he seemed much calmer. Usually when he has a bath his irritation becomes more itchy so I was very impressed that this had the opposite effect. I use a lot of dry shampoo on myself but I have never thought about using one on my dogs. It makes sense though. Dogs can smell!! Bathing them too often is no good for their skin and coat – especially Stitch with his sensitive issues. However if you have people over, especially non dog people you want your pooches to smell good right? 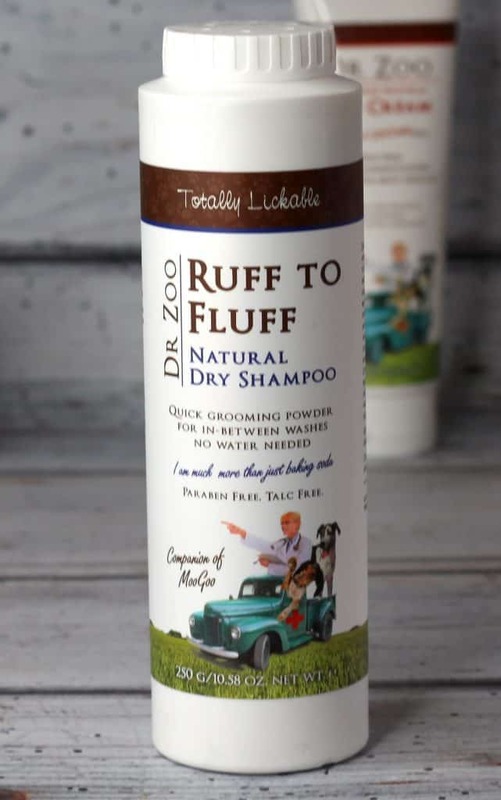 Cue Ruff to Fluff Dry Shampoo. I was skeptical about how good this product would be but it gave both dogs a freshen up with little effort and didnt;t smell overly perfumed. Most importantly it didn’t irritate Stitch’s skin which was a resounding win!! French bulldogs have dry noses. It doesn’t mean they are sick or that they need to go to the vet. It’s simply because they are unable to lick their nose like other dogs. Poor Stitch has a horrible cracked nose that is often rough. I’ve tried a multitude of products trying to moisturise him back to health to no avail. So I was skeptical that Crusty Nose Itchy Toes would be any different. I took a small amount of the balm in my fingers and warmed it up gently before applying to Stitch’s nose. It smells nice without being perfumed or fragranced which was a plus. No-one, man or dog wants perfumed cream sat right on their nostrils! The balm is completely safe for them to lick but does have a bitter taste to deter them from licking it all off immediately. This obviously wasn’t an issue for Stitch because he physically cannot lick his nose. After a few hours the difference to his nose was visible! 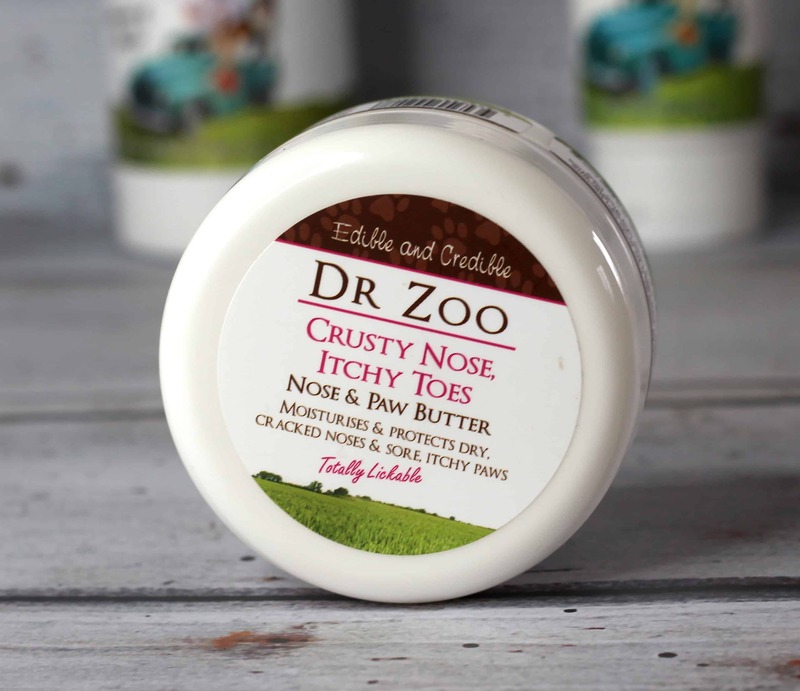 The balm is extremely moisturising and the first nose cream I have used that not only worked but worked so fast! Stitch is a sun worshipper and lays out in the sun belly to the sky cooking like a small joint of pork. I have to move him A LOT so that he doesn’t actually cook and that’s why for a dog like him sun protection is essential. I apply the sun cream to the inside of his ears (Which are like little sun radars) and his belly. The cream is completely edible should they decide to lick it off which is hugely reassuring. Stitch has been basking in the surprise sun we have had the last few weeks and the sun cream has helped prevent any sun burn incidents!! The cream is easy to apply and rub in! I have to be honest in saying that sometimes you get ‘natural’ products that are gimmicky but not all that efficient. I judged each product based on that and was left completely surprised. The idea of finding products that are natural but efficient for my family, myself and also my dogs is exciting. I am very happy I have found this company! Price wise the products are fair in comparison to whats on the market and they hands down beat a lot of similar products that are available. The only niggle I had, was with the Sunscreen but when I spoke to MooGoo they were so helpful and reassuring that the bottle is already in the process of being changed! My favourite item had to be the Sunscreen. It took everything I love and need about sunscreen and got rid of all the bits I hate!! It was so effective too! 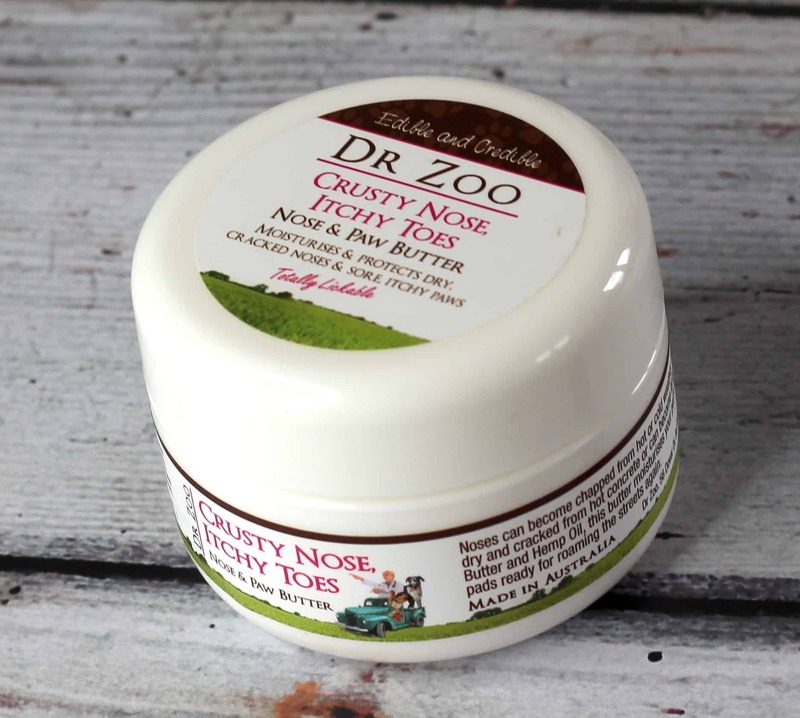 From the Dr Zoo range the Crusty Nose Itchy Toes Balm was a hands-down winner for me. Finding a product that will help Stitch’s nose that quickly is amazing!! I love that both MooGoo Skincare and Dr Zoo are natural, effective ingredients and they don’t test on animals! To see the full range from MooGoo Skincare head over to their website here. For the full range of Dr Zoo head over to their website here. Thank you so much for stopping by! If you want to check out some other great reviews don’t forget to head over here. Love as always! 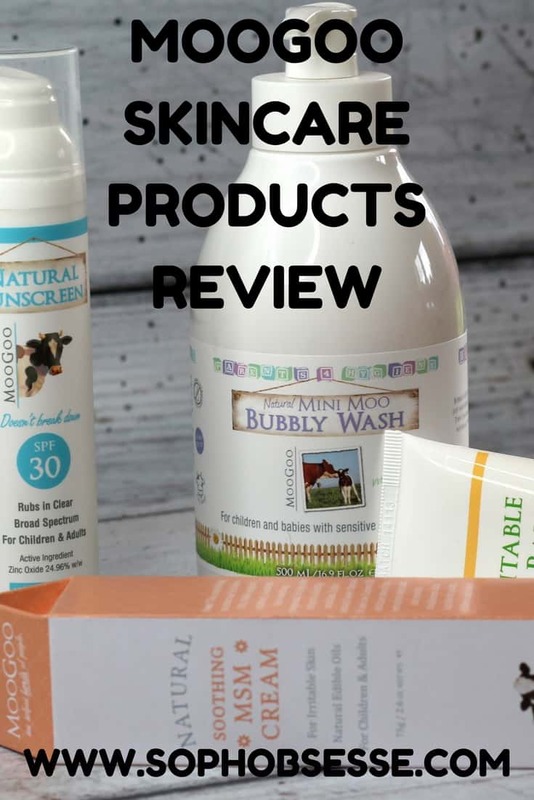 *I was sent these products on a gifting basis in return for an honest review. As always all words, opinions and views are my own. For more information on any of this please head over to this page.